4Easysoft iPod Mate packs four iPod software for iPod fans, DVD to iPod Converter, iPod Video Converter, iPod Manager, and iPhone Ringtone Converter. 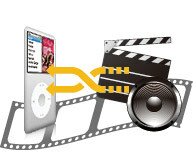 So, it can help you convert DVD to iPod, convert all popular videos to iPod, copy iPod video/audio to Computer, import files from Computer to iPod, even copy iPod to iPod. As a powerful combination, 4Easysoft iPod Mate also allows you to make iPhone ringtone by yourself or convert video/audio to iPhone M4R ringtone directly. 4Easysoft iPod Mate is your best choice to manage your iPod files. Under the help of this iPod Mate, you can enjoy any DVD or video on your iPod easily, make your personalized ringtone for your iPod. 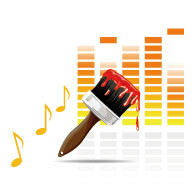 Now, you can free download 4Easysoft iPod Mate to explore your iPod digital experiences. With the constant upgrade, 4Easysoft iPod Mate can also support iTunes 10.1 and iOS 4.2. 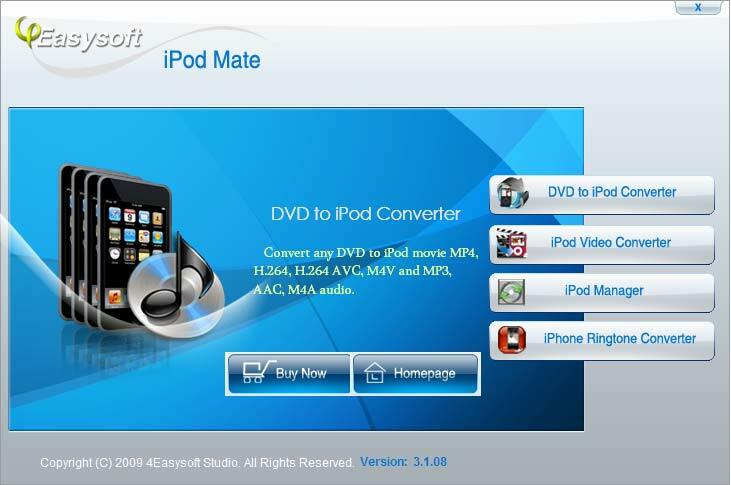 4Easysoft iPod Mate helps you to convert DVDs to iPod compatible video/audio formats, also can convert all popular videos to iPod in fast way. iPod Video Converter software can copy iPod videos or audios to Computer easily, or import Computer videos/audios to iPod directly. 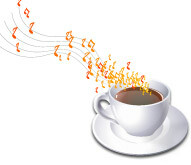 With iPod Manager software, you are easy to copy iPod videos or audios to Computer, or import Computer videos/audios to iPod directly. It is available to make any videos/audios as your iPhone ringtone by converting those videos/audios to iPhone ringtone compatible audio format - M4R. 4Easysoft iPod Mate software is compatible with all types of iPod, including iPod classic, iPod nano, iPod touch, iPod touch 4, iPod shuffle, even iPad, iPhone 4G and iOS 4.2. Selecting which iPod software you need in this pack, you can quickly finish your iPod video conversion, iPhone ringtone making or other tasks, within only a few clicks, it is easy enough to use for everyone. A friendly designed user interface makes your video conversion more convenient and doubles your enjoyment.